Another day in the desert. 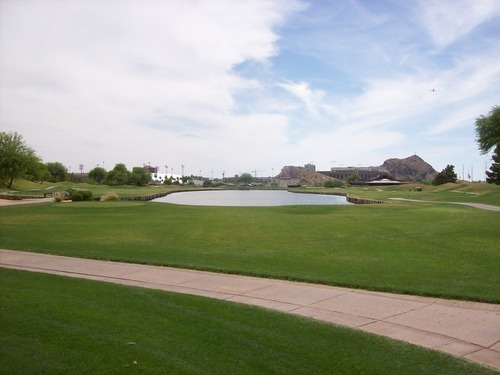 Two more great golf courses! 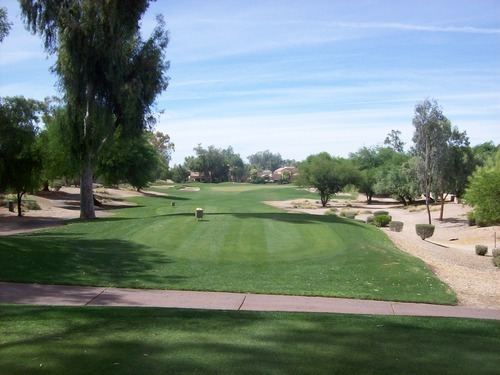 After 36 holes under the not-nearly-as-hot-as-expected-but-still-fairly-toasty Arizona sun yesterday, I was ready to tee it up again bright and early this morning. I got invited to come out and play this exclusive course today along with a few of the Greenskeeper.org guys I played with yesterday. 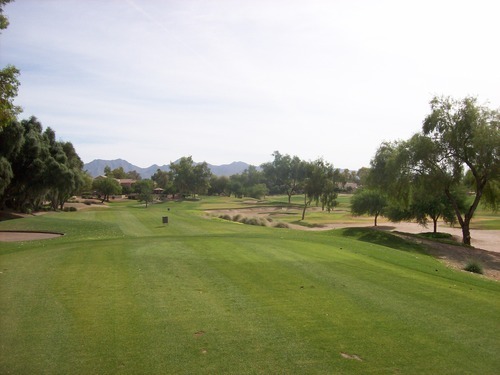 They had some good hook-ups and we had a rare opportunity to play Gainey Ranch as guests for the day. 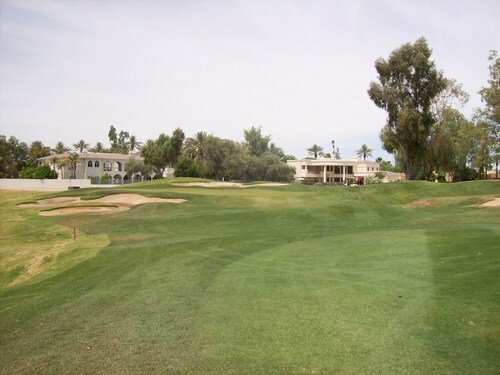 This is a nice private club in Scottsdale, so it was definitely a lucky break for me! 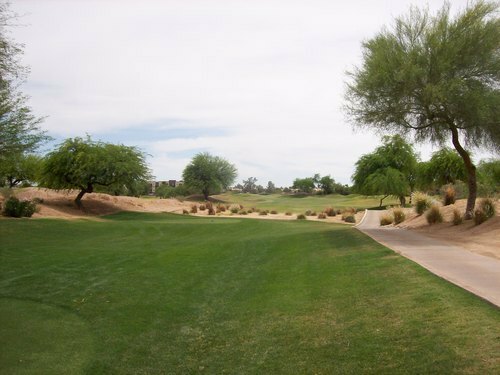 There are three nines at Gainey Ranch (Arroyo, Lakes and Dunes). 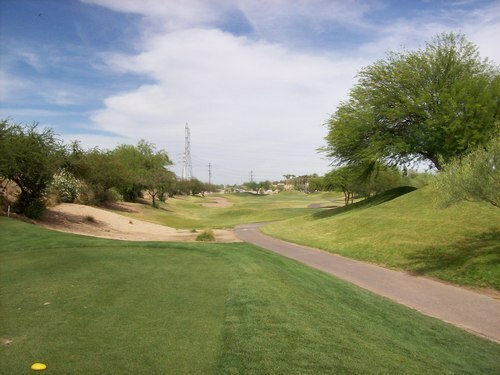 We started on the Dunes course at 8:15 and then played the Arroyo course as the second nine. Both were great layouts that each lived up to their names. 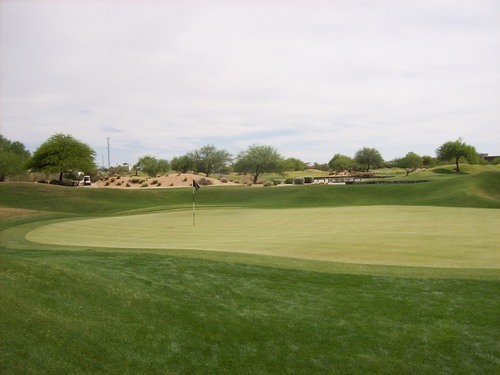 The Dunes is a deceptive layout. 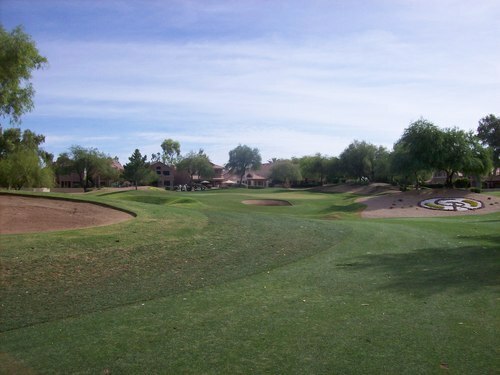 It’s not terribly long and is more of a target style course with narrow fairways, severe doglegs and well-placed bunkers that force you to take strategic angles off the tee. 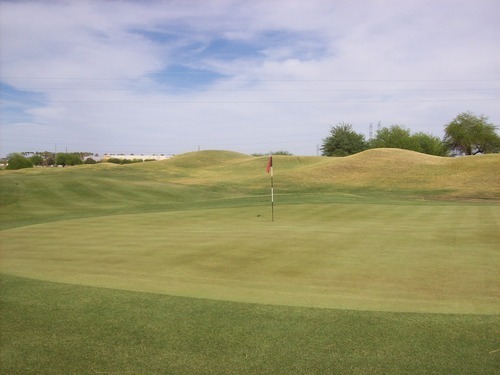 The greens aren’t huge here, but they have some amoeba-like shapes and pins can be very tough to get at if you are coming in from the wrong angle. We didn’t play the Lakes course, but you can clearly see from the holes next to the clubhouse that it certainly lives up to its name, as well. 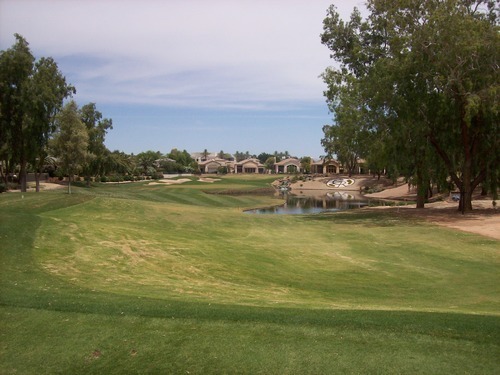 The highlight hole on the courses we played is the signature par-3 6th hole on the Arroyo course. It’s a beast. 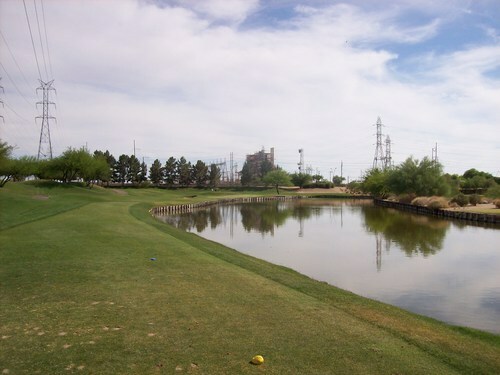 It’s listed at 173 yards, but it seems to play longer than that. Of course, they had a super tough pin placement today that made it even longer and more intimidating from the tee. There is water all the way up to the green and then along the ride side of it with a decorative waterfall and big GR logo next to it. You’ll see in the pictures it’s a knee-knocker of a hole! 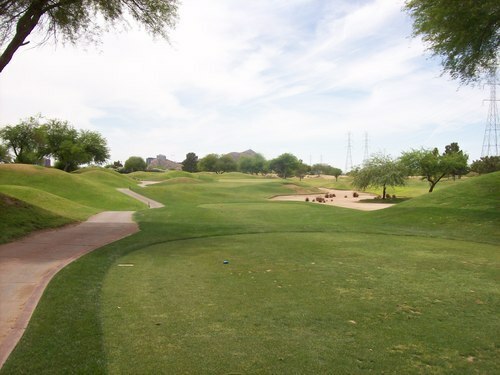 The course was in decent “transitional” shape. The fairways were mostly nice to hit from and the rough was a little less consistent with the winter grasses dying out and the summer grasses starting to come in. 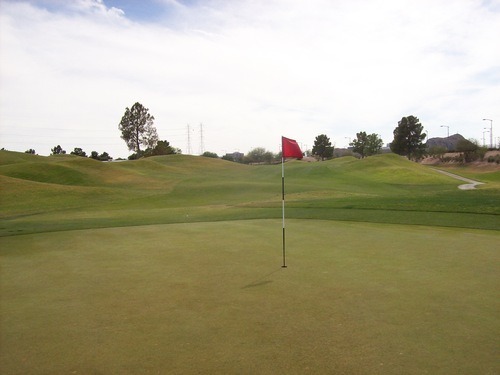 The greens looked a bit ugly and some had been micro-punched as part of the transition to summer, but they rolled pretty smooth and true on putts. They were quite firm and hard to get any bite on approach shots and chips. I definitely enjoyed my time on this course and the experience of feeling special as if I were one of the regular members at the club. 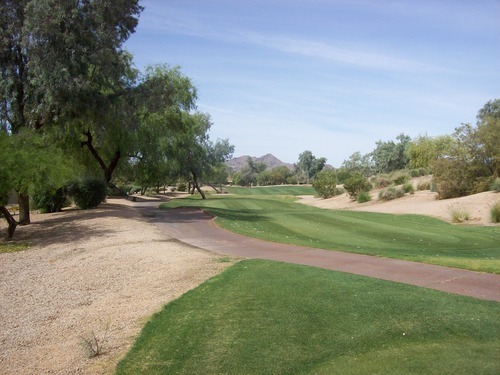 I’m definitely grateful for getting to play it on this trip and it added to the diversity of desert course designs, locations and scenery I’ve been able to sample this short trip. 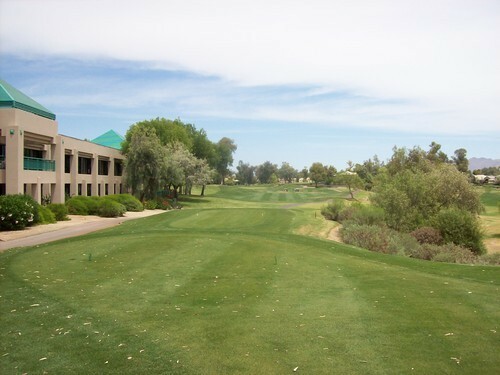 As soon as we finished at Gainey (in under four hours), I took off immediately because I had another tee time to catch down in Tempe. Unfortunately for me, sometimes there’s no time to waste! My tee time was for 1:08. 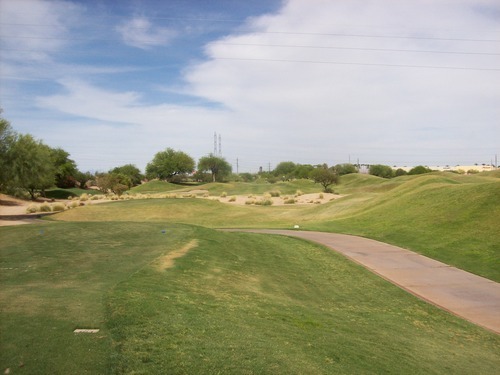 I originally planned to play this course at some point on the trip because it was on my OB Sports discount card and also because the future of this course is somewhat uncertain. More on that later, though. 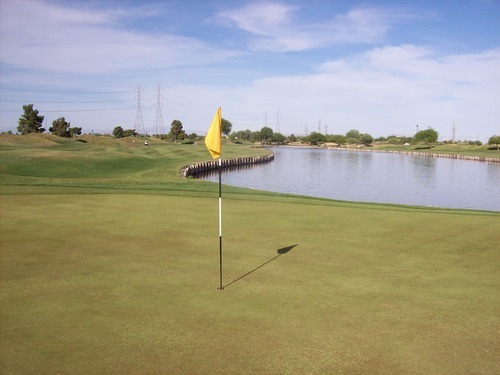 However, I still looked at times online and found a “hot deal” rate on GolfNow ($30) that was even better than the $39 rate I would have gotten with my card. So I booked it. What’s unique about ASU Karsten is that it’s actually on the Arizona State University campus, right next to all the other stadiums and athletic venues there. 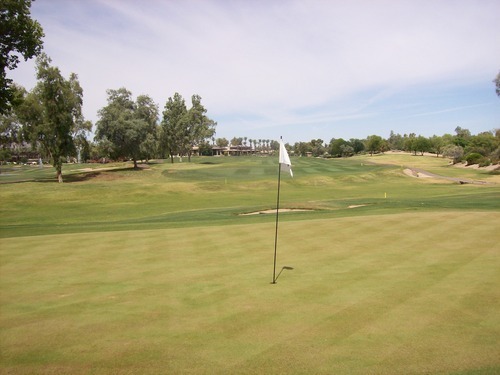 All colleges with golf teams have their own “home” courses, but not that many have one right on the grounds. From what I understand, that’s one of the reasons why their biggest golf alumnus, Phil Mickelson, chose it over other west coast schools. 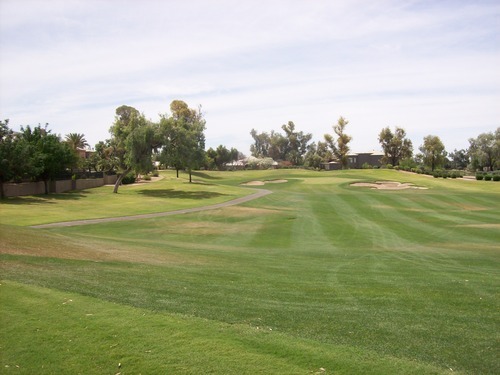 Unfortunately, as the school continues to grow, the large property that houses this golf course is becoming increasingly valuable and there have been rumors in the past couple of years that they’d ultimately close it to use the land for bigger and better things. That would certainly be a shame, but it is what it is and that’s a big reason I wanted to make sure I got to play it on this particular trip to the Phoenix area. The course seemed somewhat busy as I pulled up and saw a bunch of people on the driving range and practice green. There appeared to be a junior tournament that had already played earlier in the day. I was hoping an afternoon round would be nice and quick so I didn’t have to bake in the sun anymore than I had to. Though temperatures were very mild this morning, by the time I got to Karsten it was rather muggy and not nearly as enjoyable. But things worked out as the clouds eventually dissipated, a nice breeze picked up and the pace of play turned out to be fantastic. I was paired with another single and a twosome and we actually teed off a few minutes ahead of our time. We didn’t run into anyone in front of us all round until the last few holes and nobody was pushing us from behind, so we enjoyed a brisk 3.5 hour afternoon pace as a foursome. Now, I’ve made it no secret that Pete Dye is one of my favorite course designers. I like his visual trickery, risk/reward layouts and elements that are sometimes quite evil and sometimes quite forgiving depending on the bounces you get. I won’t say ASU Karsten is Dye’s best work, but it does offer all the hallmarks you’d expect from one of his designs. 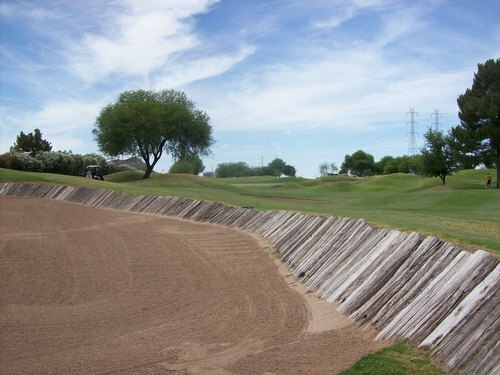 Railroad ties along some of the bunkers and water hazards. Mounds, mounds and more mounds–everywhere you look from tee to green to provide contour to an otherwise very flat and desolate piece of desert land. These moguls are quite severe on Karsten and definitely factor in more than anything else out here. 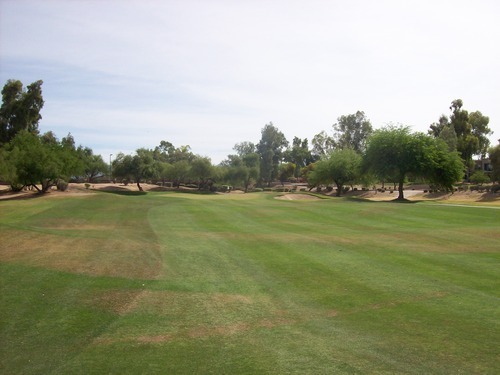 Here’s the trick with most Dye courses that uses this much mounding…if you land in the fairway (which is sometimes easier said than done with his dramatic angles), you will generally be rewarded with a flat lie and a good look at the green. If you miss the fairway (even if only by a few feet) you are at the mercy of Mr. Dye. Sometimes the mounds can kick you right back into the fairway. Sometimes they’ll kick you off into the desert. Sometimes you’ll get stuck right on one of them and be left with a really difficult stance. 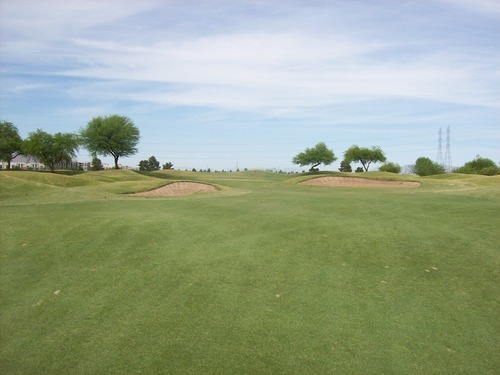 And of course, there are also some big fairways bunkers and water hazards that can grab your ball. 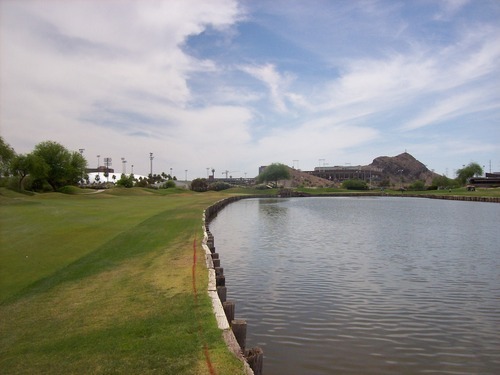 Water does come into play a number of times on this course. 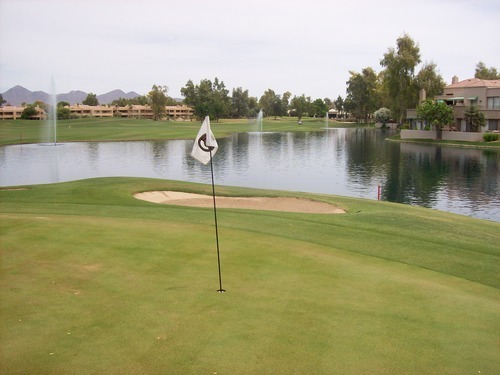 One hole that stands out to me is the really nasty par-3 16th with water all along the right. However, there is a lot of bail-out room left if you want to play it extra safe. 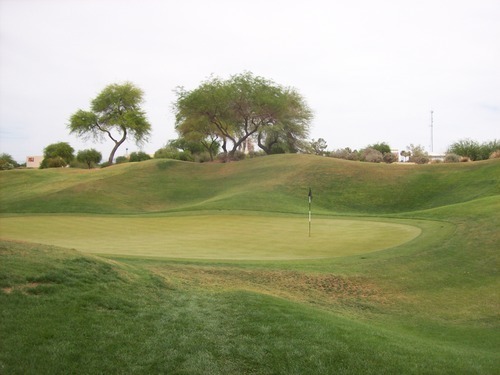 The holes that really stand out the most, though, are the clever “mirror image” 9th and 18th holes. These are very, very tough finishing holes for each nine. 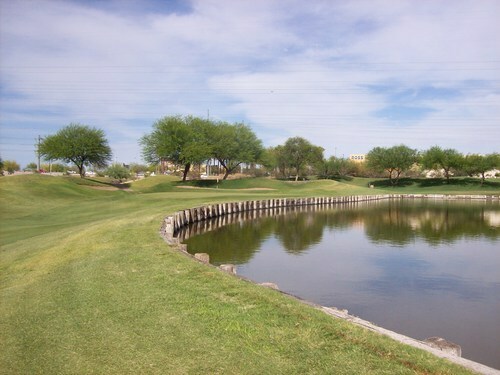 There is a huge lake between the two that comes into play from tee to green. The 9th plays left of it and the 18th plays to the right of it. If you need a point of reference, the 18th here very much resembles the 18th hole at TPC Sawgrass. Now imagine that with a twin brother to the left of it. 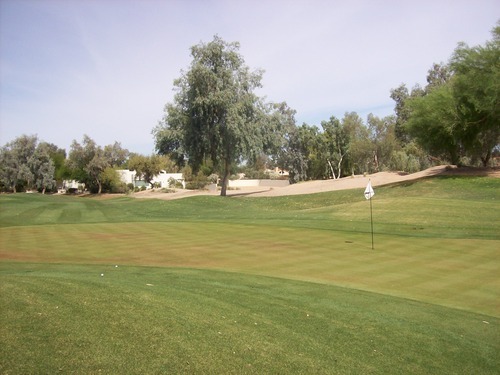 My one big complaint with ASU Karsten is the length on the par-4 5th and 10th holes. 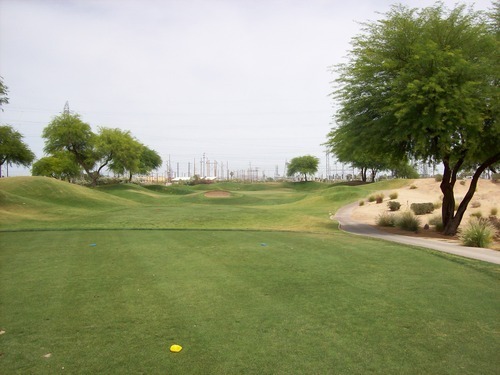 This course currently plays as a par-70 and apparently these both used to be par-5 holes that they converted for some reason. They still play at quite a length (the 5th is 462 yards and the 10th is 478 yards from the gold tees which most guys will play). 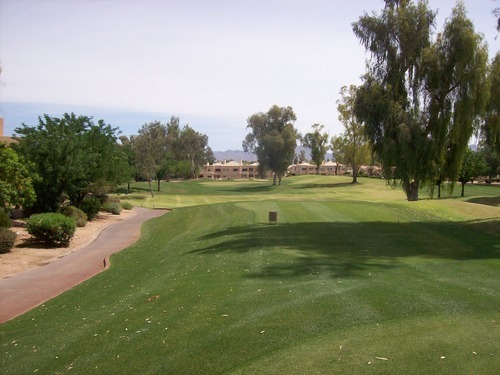 From the tips, both holes are listed at over 490, but there are additional tee boxes even further back for tournament play that are well over 500 yards. As it was, I believe number 10 was the longest par-4 I’ve ever played! 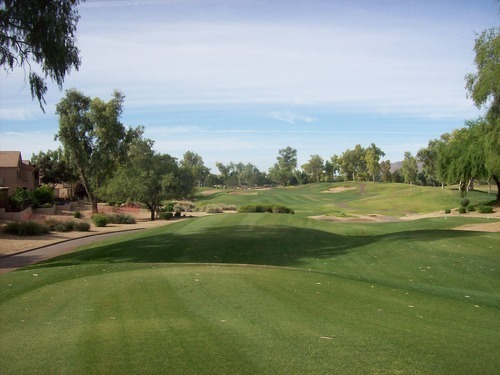 Seems like the course would be nicer for non-tournament play (as in, for us regular folks) with both of these playing as par-5s and a traditional total par of 72. 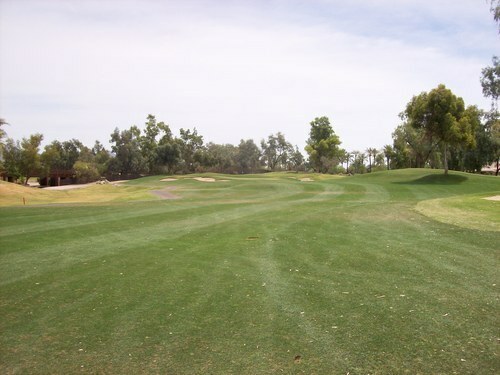 Also, as it is now, you don’t play any par-5 holes until the 14th hole, which is just plain weird. 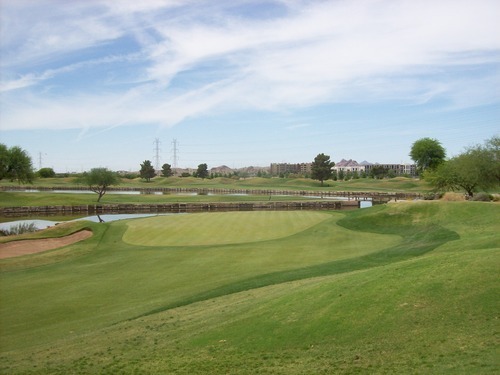 ASU Karsten also offers an unusual environment for golf with all the sporting venues right next door. There was a big women’s softball game happening while we played the front nine, so cheers and music from the stadium were quite loud. I can only imagine what it’s like here when there’s a football game at Sun Devil Stadium. That is, if the course is even open on game days. I’m not really sure. 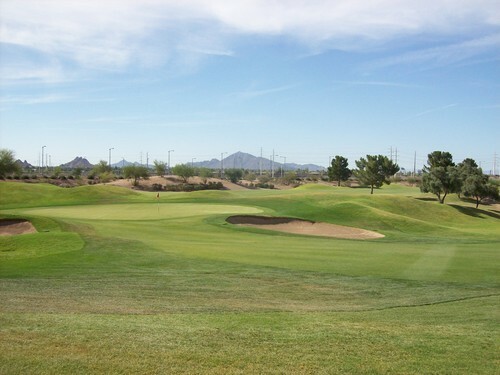 Other than the athletic complex and the iconic football stadium, the scenery is definitely lacking at ASU Karsten. Much of the course runs along a very industrial looking part of the campus with all sorts of power lines, communications towers and ugly buildings. It’s hard not to be reminded of my round last year at The Rawls Course at Texas Tech. 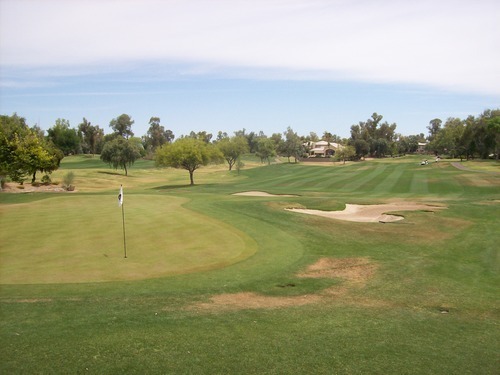 Other than the design and aesthetic differences of Pete Dye and Tom Doak, both took very uninteresting land and moved a lot of earth to sculpt interesting layouts for collegiate level challenge. 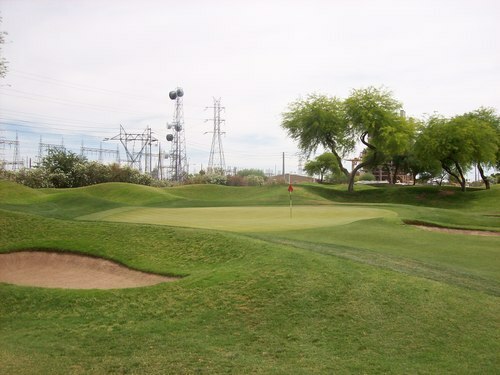 The conditions were just so-so at ASU Karsten as it is also in the transitional phase like most other courses out here. 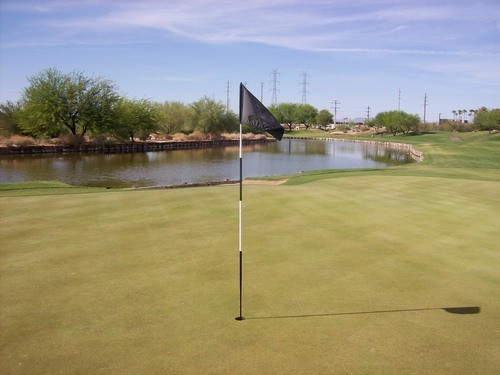 The greens were fine. A bit brown in color, but probably the most receptive I’ve experienced all weekend. Smooth on putts with hidden breaks. 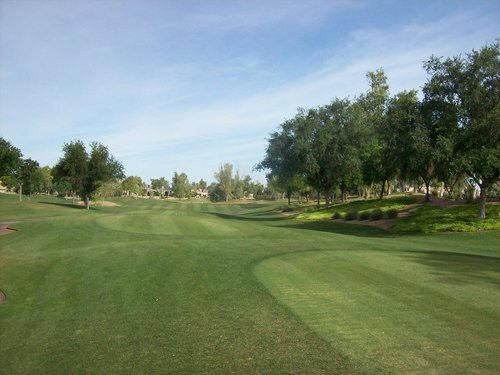 The fairways were a little dry, but good lies to hit from all day. The rough was weird. It had all sorts of crazy cuts that seemed to have no rhyme or reason. There were different types of grasses cut at different lengths. There were distinctive lines between the various cuts, but nothing seemed to make sense in a way you’d expect with the shape of the holes and the landscape. It’s hard to explain, but it definitely stood out to me. I really wanted to like ASU Karsten more than I did. It’s a fine course and definitely has Pete Dye’s hands all over it, but it didn’t blow me away like so many of his other courses have. Part of that is due to the setting of the course, since most of his courses are usually have more dramatic surroundings to work with. I kind of knew that would be the case going in after looking at pictures, but I held out hope that it would really “wow” me. However, for the price I paid, it was a fantastic deal and it’s still a very enjoyable layout on most levels. I’d definitely hate to see it close. That would be very sad. I have one more round scheduled to play tomorrow morning and then a long, boring drive back home. 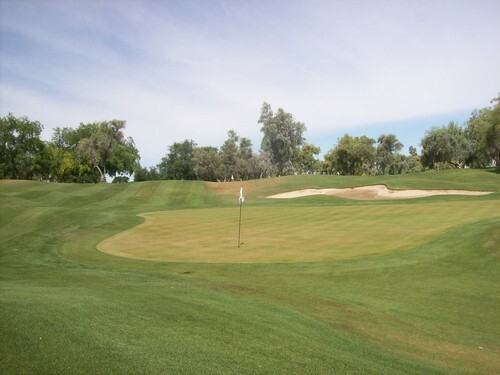 I’m not sure when I’ll get to post stories and pictures from that round, but I will let you know I am playing Raven Golf Club Phoenix. Looks like a great course!